Looking for some great laundry services can feel overwhelming sometimes. This is because there are many different dry cleaners and laundromats out there. Some are going to be better than others and offer superior services. So what can you do to make sure you can find some great dry cleaning and laundry services? One of the best things you can do when you are looking for superb laundry services is to read the reviews. These reviews are written by people who have visited a particular laundromat personally. This means they can provide a wide range of information regarding the quality of services you can expect from the dry cleaners you are interested in. Also, if you are worried about the accuracy of these reviews, just look at the overall tone of the reviews. If many people say it’s good, then chances are it is pretty good. Not all laundromats provide the same services. 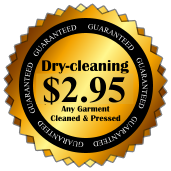 Some offer dry cleaning, some offer alterations, and some provide a mix of everything. To make sure that you are able to receive the services you need, it is important to do your research. By knowing what you need, this will help narrow down your choices and make life a bit easier for you. This can also help you find reviews on particular laundromats that have the services you are looking for. When you are looking for the best laundry care in Maryland, it is important to consider the price. Every establishment is going to have a different rate on their services. To make sure that you are getting the most value from your dollar, it is important to compare the prices and quality of services of the various businesses you are interested in. When time is short or if you simply do not have the means to wash your laundry properly, you will need a reliable laundromat you can count on. Finding a good dry cleaner is not difficult but it does pay to do your research ahead of time, to ensure you can get the best services. If you find this blog helpful, please share it with your friends and if you want to learn more, you can check out our website anytime. ASAP Cleaners is here to serve you. This entry was posted in Dry Cleaning and tagged Clothes, Laundry, Laundry Quality. Bookmark the permalink.